It is copyright © Mark Pirie and Jacket magazine 2010. See our [»»] Copyright notice. There’s a side of Richard Berengarten which is pure raconteur, entertainer, and there’s nowt wrong with that. Can a book have no back cover? Moreover, should a book require a back cover, or even an end? These are the entertaining and innovative questions behind Richard Berengarten’s book with no back cover (hereafter bwnbc). These questions deserve discussion, not just for the original book design and for the thinking behind the poems, but also because of the way the book brings together two ‘sets’ or sequences (one ‘complete’), to challenge concepts and conventions of book production and writing that we often take for granted. Such an approach is not only original and peculiar to the book at hand, it is also markedly different from Richard Berengarten’s other sequences and poetic constructs, which operate in a more traditional sense; and it adds a ‘newer’ and postmodern dimension to his already considerable oeuvre. And, quite apart from its placement in this oeuvre, the fact that some of this book’s features are interesting and unusual, and perhaps even provocative — in terms of how we think about and perceive ‘the book’ — suggests that it is worth opening up exploration of these features. These are the ideas I would like to explore, but first let us go back to my initial encounter with Richard Berengarten and his bwnbc. In March 2005, I visited England for the first time to attend the London Book Fair as a New Zealand poetry publisher (HeadworX). That year the London Book Fair featured Australasian publishers, and a ‘Kiwi contingent’ arrived in London to promote their authors and catalogues. Via email, my contact at Salt Publishing, Jen Hamilton-Emery, recommended that I meet the poet Richard Berengarten. One morning in London, I went to the Poetry Library and looked up his work. On the library shelf there, I found numerous collections of his, dating back to the 1970s. As I glanced through them, their technical skill and intellectual depthimpressed me. I knew by skimming through the pages that here was a poet of considerable power and gifts, who was capable of writing poems often without the wilful obscurity of much academic poetry, and who conveyed a certain honesty and compassion about the human condition and its accompanying tragedies, i.e., war, massacres, genocides and political injustices. I then made a point of contacting Richard Berengarten when I visited Salt (which publishes us both) in Cambridge that month. He struck me as generous and very sociable. He enjoyed showing me his recent work and book collection, which I noted had an East European influence. We traded books and notes. He swapped two books with me, one of which happened to be bwnbc. This particular book continues to intrigue me. The design is eye-catching and many visitors to my home have stopped in their tracks when I have shown them a copy. As a ‘commodity’, Berengarten’s book is a collection of poems, no more, no less; but it also has the quality of an ‘art object’, and this in itself suggests that the author’s intention is that the book’s design and form should complement and extend the ideas behind the text. Charles Olson, quoting the young Robert Creeley, has stressed that ‘FORM IS NEVER MORE THAN AN EXTENSION OF CONTENT’ (1966: 16); and Berengarten, in following this idea, opens up interesting challenges to (and questions about) the ‘commodification’ of the book in the market-place. I suppose you might say, before looking closely, that Berengarten’s book is commonplace in its design. The book is in A5 size with the author’s name and title on the cover, in black and white and, below, a quotation from the text sprawling diagonally across it. Commonplace? Ordinary? Hardly. On closer inspection, turning to the back cover… hold on… there is no back cover! Where are the blurb, jacket information, price and bar code? They are missing completely, and instead, the front cover repeats itself on the ‘other’ cover of the book. Hence the concept of a ‘book with no back cover’, brilliantly and faithfully exploited by the designer Will Shaman for David Paul Books. The spine is unusual too. The author’s name and title repeat themselves down the spine both ways, as if mirroring each other. Inside, the part of the book you start from (depending on which way you open it) reads like an ‘ordinary’ poetry collection. Yet halfway through, an arrow directs the reader to turn the text upside down and begin again from the other cover. So — turning it upside down, you can read the other part of the book in the opposite direction from the one you originally started from, and again find no ‘end’. bwnbc contains one more surprise in layout: the typesetting of the ‘found’ poem entitled ‘Code of Practice’. This piece, positioned across a double-page spread, is at the centre of the book, and bases itself on an English legal text. On the verso page, the first line is printed left to right, the second line right to left in mirror writing, the third line left to right, and so on. (This form of script, known as boustrophedon, occurs in some ancient Greek legal inscriptions.) The entire text mirrors itself on the facing recto page. Readers familiar with Berengarten’s recent work will also recognise the form of one of the book’s halves, as well as its human and metaphysical concerns. This part is divided into three sections: ‘Sketches with Voice-overs’; ‘Nine Codas’; and ‘Code of Practice’. These poems continue a style that Berengarten developed in his earlier long poem, The Manager (2001). Berengarten calls this the ‘verse paragraph’: a long unit, usually consisting of two to three lines of text, evolved from the models of Blake, Whitman, Ginsberg and the verset of modern French poets, e.g., Saint-John Perse. The other ‘set’, under the title ‘Following’, features a spare, minimalist style, that connects more with the work of American poets William Carlos Williams, George Oppen, Louis Zukofsky and Robert Creeley,  and with Asian forms like the haiku, than with any contemporary British exponents of minimalism. In Berengarten’s hand the minimal takes on a wrought and finely-tuned appearance on the page, much like the product of a sculptor who has chipped away at stone or of a gardener who has carefully removed branches from a bonsai tree. This Asian image is quite apt, in that these poems owe a great deal to Berengarten’s readings of the Yi Jing,  and of Zen and Taoist thought. At the end of ‘Following’, he includes ‘A Note on the Hexagrams’, which relates each poem to a particular hexagram from Yi Jing. These poems also link with Heraclitus, Ungaretti and Jabès, three Western ‘presences’ who also appear to have had an impact on Berengarten’s thinking. On the surface, this poem shows a refined elegance. It is carefully written. Each word counts and the style is pared of ornament. Its lean lines and unforced enjambment are highly accomplished. ‘Grace’ is a fine example of minimalist poetry, comparable to the best of Robert Creeley’s work, though perhaps more emotionally restricted than Creeley. Richard Aldington’s books of Images also come to mind, through the sensual appeal of details like ‘chestnut’, ‘oak bud’ and ‘red tulip petals’. To me, ‘Grace’ is a poem of celebration for the living and for the dead. The poet refuses to give an inch to mortality, wishing humanity to live on in song, in poetry, in defiance of death. This recurrent theme in Berengarten’s work is no better expressed than here, in this new minimalist mode. bwnbc differentiates Berengarten from poets who have attempted to remove the personal voice from their poetry and the metaphysical from their worldview. Instead, he shows how a poet can combine metaphysical themes with postmodern forms of design and thought; and in doing so, he urges the reader to be a part of what makes and shapes the world we live in: ‘The label on the package / ‘To Whom it May Concern’ means you’ (bwnbc 48). Perhaps the only drawback is that some parts of the book give the impression of being experiments lifted from the poet’s notebook. Steve Spence (2003) has suggested that some of these poems consist of ‘residual’ material from The Manager; and some of the ‘Sketches with Voice-overs’ do read like out-takes from that book; while the minimal poems based on Yi Jing are not as compelling as Berengarten’s earlier Olsonian ‘field form’ work in Avebury (1972). Nevertheless, the sequence of powerful ‘codas’ creates cohesion, even though the presence of ‘codas’ might seem an irony in a book with ‘no end’ and ‘no back cover’. Yet overall, the experiment of making his book with no back cover adds an extra dimension to Berengarten’s central themes and oeuvre. It shows him to be a versatile poet capable of adapting contemporary postmodernist theories and practices as well as traditional forms, and subverting them not only in telling and thought-provoking ways, but also in a highly enjoyable and entertaining manner. For the Living (2004) also displays the rich adaptability Berengarten is capable of as a poet. From the earlier ‘Avebury’ (1972) to the tight villanelles of ‘Black Light’ (1984), Berengarten has always shown that his range as poet is vast and his technique accomplished. His excursion into Yi Jing in book with no back cover is similarly well-wrought and skilled. bwnbc offers a rewarding and innovative presentation of theoretical concepts that are carried into the book’s design. The book is invigorating in its technique that both reflects and embodies its content. Its innovative nature and the challenges it makes to conventional ideas of ‘the book’ mean that it occupies a highly original and even a unique position in contemporary British poetry. book with no back cover is a book we could all do well to complete. you, being the one who found it. the book is yours to complete. (bwnbc 48). Aldington, Richard. 1948. The Complete Poems. London: Allan Wingate. Berengarten, Richard. 2004. For the Living. Selected Writings 1: Longer Poems 1965–2000. Cambridge: Salt Publishing. ———. 2001. The Manager: a poem. London/Bath: Elliott & Thompso. Burns, Richard. 2003. book with no back cover. London: David Paul. ———. 2001. The Manager; a poem. London/Bath: Elliott & Thompson. Cooley, Peter. 2003. A Place Made of Starlight. Pittsburgh: Carnegie Mellon University Press. Creeley, Robert. 1991. Selected Poems 1945–1990. London & New York: Marion Boyars. Kendrick, Scott. 2007. Cold Comfort Cold Concrete: Poems & Satires. Seraph Press, Wellington. Mandelstam, Osip. 1977 . Selected Essays (tr. Sidney Monas). Texas: University of Texas Press. Olson, Charles. 1966. Collected Writings. New York: New Directions. Paterson, Don and Charles Simic (eds). 2004. New British Poetry, Minnesota: Graywolf Press. Reading, Peter. 1995. Collected Poems 1. Newcastle upon Tyne: Bloodaxe Books. –––. 1996. Collected Poems 2. Newcastle upon Tyne: Bloodaxe Books. Spence, Steve. 2003. ‘Review of Book With No Back Cover [sic] by Richard Burns’. www.terriblework.co.uk/Archive%20whole.htm (consulted 15 August 2007). In New Zealand, Scott Kendrick’s Cold Comfort Cold Concrete: Poems & Satires (2007) has a design similar to Berengarten’s book, though Kendrick’s book divides itself merely because it is two-books-in-one. This type of inclusive address to the reader is also present in the American poet Peter Cooley’s collection A Place Made of Starlight (2003). Cooley, however, includes the reader in his poems for different purposes to those of Berengarten’s work. Email from Richard Berengarten to author, August 2007. Contrast this work with the minimalism of British poets Ian Hamilton or early Hugo Williams, for example. Also known as the Book of Changes (Yi Jing / I Ching). Email from Richard Berengarten to author, November 2007. Email from Richard Berengarten to author, August 2007. In ‘A Little Further?’, paragraph 9: ‘Who wants a heartless poetry?’ [www.berengarten.com/site/A-little-further.html]. On his website, Berengarten lists the influences behind the book’s conception. Despite his Cambridge background, and apart from his citing of T. S. Eliot, these are not typical or traditional influences for a British poet: Osip Mandelstam, Borges, Paul Celan, Edmond Jabès and Nasos Vayenas. The website also lists his twin central themes in bwnbc as: ‘first, that no book has an end; and, second, that all books are part of the one Book Without End. [… ] Furthermore, Book With No Back Cover [sic] challenges notions of linear, ‘progressive’, ‘developmental’ time, as well as Aristotle’s prescription in The Poetics about the need for “a beginning, a middle and an end”… ’ [see: www.berengarten.com/site/A-little-further.html]. Mark Pirie is an internationally known New Zealand poet, fiction writer, editor and small press publisher (HeadworX). His critical writings have been widely published in more than 10 countries. An earlier essay of his appeared in the Journal of Commonwealth Literature while he was a postgraduate student at the University of Otago, Dunedin. 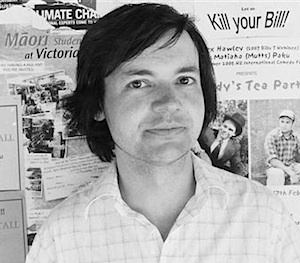 He contributed an 8,000-word introduction to his anthology of ‘Generation X’ New Zealand writing, The NeXt Wave (University of Otago Press, 1998) and has also written poetry reviews and articles for brief (NZ),Jacket (Australia), JAAM (NZ), New Zealand Books, Poetry NZ and Southern Ocean Review (NZ). His other work includes 21 books of poetry, a book of short stories and a book of song lyrics. Salt Publishing, Cambridge, England, published a selection of his poems, Gallery, in 2003.